Cecina is salt-cured, air-dried beef, and is truly a delicacy of Spain. The origin of the word cecina is not altogether clear. Some believe that it comes from the Latin saccus, meaning dry, while others believe it originates from the Celtic piercing and is related to modern Spanish "Cerezo" or Northwind. The oldest written reference to Cecina dates from the 4th century B.C. and the description of the process is the same as it is today. For centuries, homes in the Maragara area (in the northwest of Spain) traditionally kept a dried beef leg in the larder to feed the family. Although cecina can be made of other meats, such as goat, horse, bull, or rabbit, the most common is made of the hind leg of beef. 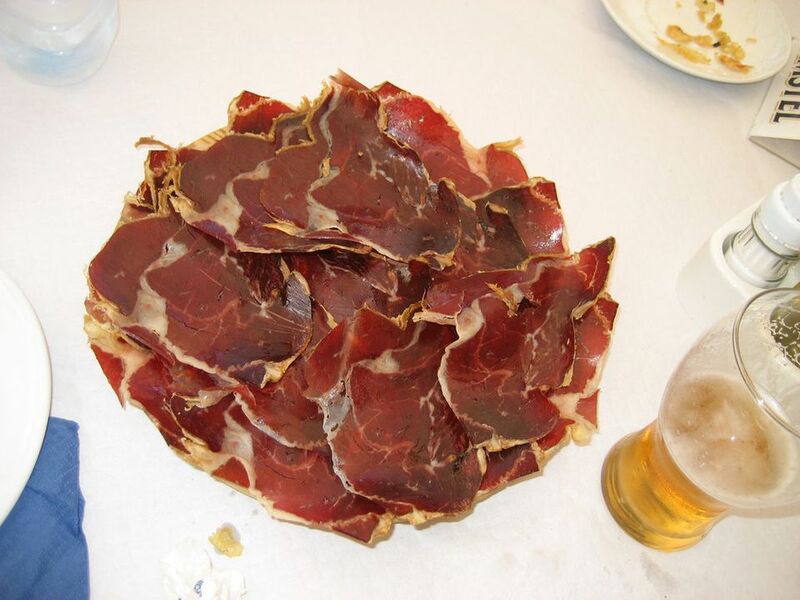 Cecina is primarily eaten in the provinces of Leon and Zamora, although it is also produced in the Basque Country and is well known all over the Iberian peninsula. The cecina produced in Leon, aptly called cecina de Leon, is famous for its quality and has a protected geographical identification under the law. The altitude (over 800 meters) and dry climate of Leon are perfect for the production of cecina. First, the meat is cured in salt for a specified number of days. Any remaining salt on the outside is washed off. It is then smoked in oak for two to three weeks. The final step in the process is to dry the meat in special rooms, where windows can be opened and closed, regulating the temperature as well as humidity. The entire process takes seven months, according to the Regulating Council (Consejo Regulador I.G.P. Cecina de León). Pieces of cecina have a brown crust, which is cut off before eating. Inside, it is a dark cherry to maroon color, with small veins of fat running through it. It is slightly fibrous and has a distinct flavor. Although cured in salt, it is not salty. It is usually sliced very thin and served as an appetizer by itself or with bread and/or fruit. It is easy to find Spanish cecina suppliers and stores on the Internet, who will ship directly to you in the E.U. Unfortunately, cecina is unavailable in the USA. There is hope that someday we may be able to legally import cecina to the USA since a few years ago Italian cured beef, called bresaola was allowed to be imported. In the meantime, get your fill of cecina while you are in Spain! What are Catalan Calçots and Why Do Catalans Go Crazy for Them?